Roger Reeves’ debut collection, King Me, marks an impressive, I would even say needed, contribution to contemporary American poetry. His poems here present an America that is personal in its specificity, myriad in expanse and scope. 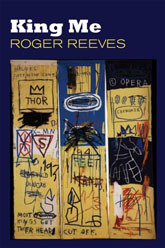 Reeves’ hands and mouth drip with the intimate relationship of beauty and violence. I leave, I leave—this will surely leave a stain. And for the poet to keep hauling, to wrestle with language, it’s the repetition of his lines that provides us the energy deep from within his tongue. He reminds himself of the fiery convulsions that lie beneath the calls and responses to racial slurs. He gets as close as he can in understanding the emotional depth of this language, almost similar to how Yusef Komunyakaa articulates “Facing It,” to say “I’m flesh,” I’m human, I’m placed inside the skin of the memorial of history, of language, and of the self—full body mirrors shimmering at every angle. This book is also “[o]pen as a wound,” showcasing a dual reality between healing and its stinging lesion. Here, “Of Genocide, or Merely Sound” illustrates an afterimage of that opened wound, and Reeves locates his readers into that sound, building dissonant tension into the initial beauty of fruit. As those seeds rest on the plate, we sit patiently to pinch the seeds to our tongues. Another perspective, too, Reeves does a masterful job at intersecting the reflection of the contemporary self with figures from the past. In a way then these poems investigate both damage and resilience embraced at a middle ground—a constant threading of historical fabric to our present modernity. And he’s not afraid to include the perforations and sewn lines that needle pins leave behind. Throughout, self-portraits help to structure King Me. We hear Tiny Davis, jazz trumpeter and singer, Duchenne, French Neurologist, Van Gogh, and even Love in Mississippi. King Me is just that. Holding the ancient crown, those who’ve honoring the past—an entire lineage of people, bodies, deaths, and reputations—and wearing it today, singing of all the aligned human flesh. Reading Reeves’ collection will give off multitudes of emotion. Several sensations at once. The slick wet tongue on dust. The dry hands parting the water. Fire drying the wet clothes of the impoverished. The horror and splendor of American identity. This is a needed book. The end insists the title “Someday I’ll love Roger Reeves.” Well, Roger Reeves, someday seems more like every day—or every poem that fleshes out the texture of this book. Can I say it again? King Me is a needed book.